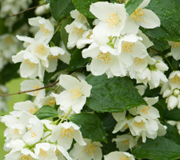 Jasmine has a strong but sweet, pleasing and romantic fragrance, which is very common in those flowers which bloom at night. Anti Depressant: The aroma of this oil has a pleasing, uplifting effect on mind and fights depression. Disinfectant: It is a very good anti septic and disinfectant.